The spindle experts at PDS want to keep your production running at peak efficiency. The information found on this page is designed to educate and enhance your process. The spindle nameplate identifies your spindle by serial number, model number, rated speed, motor and operating specifications. If you need service or have questions about your spindle, call PDS at 704-922-1206 ext.103. Please have the serial and model number available to identify your spindle. To optimize chip removal, the rotating speed to the cutting tool and the linear axis speed that the tool moves must be balanced to maximize metal removal, machine performance, and cutting-tool performance. Following is background information to help maximize machining performance. Incorrect spindle speed is a common error in CNC machining. Each material type and type of cut has an ideal tool profile and cutting speed. Larger diameter tools require slower cutting speeds. The spindle speed and feed rate for a given cut must be balanced for best work quality, tool life and spindle life. A frequency inverter controls the speed of the spindle. All spindles are 3-phase asynchronous motors with infinitely variable speed from 0 rpm to the maximum rated rpm. The speed can be achieved by correctly programming your frequency inverter drive to match the spindle. The feed rate of the cutting tool must be balanced proportionally with the spindle rpm. Changing one influences the other. Feed rates set too slow decrease tool life by causing overheating, a condition that may leave burn marks on the work. A tool moving too slowly causes the tool to heat up because not enough material is removed to cool the cut interface. The best feed rate is determined with experience and trial-and-error to achieve best results. The feed rate chart shown here provides a range for starting point values. For first-time setups, begin at the mid-range. Your cutting tool supplier can recommend cutting data for your specific application. Chip load is one factor used to determine a starting point to ascertain cutting speed (rpm) and feed rate values for the setup. For wood, a chip load that is too low generates excessive heat; the chips produced are ‘dust-like’ and may leave burn marks on the part. A chip load that is too high is pushing the cutter through the material. This generates high radial loads on the spindle bearings, and over time can cause spindle failure, excessive tool wear, and tool failure. There are two styles of milling: climb milling and conventional milling. For woodworking, climb milling produces a better finish with less tear out. Some say it provides longer tool life. We strongly encourage you to consult PDS on new spindle applications to assist in establishing your baseline cutting values. Our staff is here to discuss your technical questions by phone or email. The chart below provides chip-load values for common router tools. These are “not to exceed” starting point values for first-time setups. Actual values will vary as a result of many machine factors such as: rigidity, horsepower, collet condition, spindle integrity, part clamping, hold down, and others. 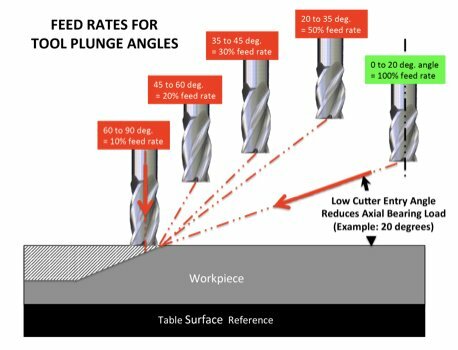 The approach angle that the cutting tool feeds to depth is referred to as Cutter Entry Angle. This angle creates radial and axial stress on the machine spindle and the cutting tool during the material removal process. The following information provides background to help determine base-line starting values for your setup. High-speed electric spindles designed for routing applications are equipped with bearings capable of achieving high rotating speeds and enduring high radial loads (side cutting). Keep axial cutting load low for best performance and increased spindle-bearing life. One way to do this is by keeping the entry angle of the cutting tool low, 0º to 20º off the table (for vertical-mounted spindles). Using a low entry angle will allow the use of higher feed rates — up to 100% calculated values for most applications. When the work piece features require a steep entry angle, the feed rate must be decreased to reduce axial load, preventing damage to the spindle bearings. Refer to the feed rate chart plunge diagram for various plunge angles. By using low entry angle, axial forces can be minimized to provide longer bearing life. Above all, avoid “crashes” of the spindle into the table, fixtures and work-piece. PDS offers special spindles for applications involving steep plunge cuts producing high axial loads. Contact the PDS Application group for details and recommendations. Electric spindles are cooled by three primary methods: fan, compressed air and chilled liquid. The more efficient methods allow for higher power ratings, longer duty cycles, smaller packages, and more severe applications. The type of spindle cooling is selected as an option and is specific to the spindle model. Fan-cooled spindles are available in two versions: mechanical and electric. Of the three methods, fan-cooled spindles provide lower efficiency. Mechanical fan-style features a spindle shaft-mounted fan that rotates at the same speed as the spindle. When the spindle is not rotating, no cooling is provided. Electric fan-cooled spindles have an electric fan mounted at the rear of the spindle. They provide constant air flow (CFM) and heat dissipation regardless of the spindle speed; running or stopped (not rotating). The electric fan style provides quieter operation, has a lower cost, and is the most popular cooling method. Compressed air cooled spindles are machined from a solid aluminum billet or tube. This housing style provides increased stiffness and vibration dampening. The high degree of cooling is achieved by directing compressed air to dissipate heat from the rotor and stator. Compressed air cooled spindles are designed for applications involving high duty cycles and harsh environments. 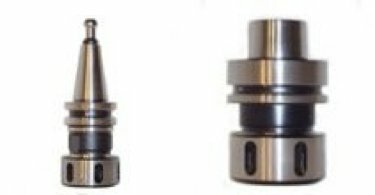 The amount of air consumption varies by spindle size and design. Chilled liquid cooled spindles are designed for use with an auxiliary closed loop chiller system. Liquid cooled spindles are machined from a solid aluminum billet or tube. This housing style provides increased stiffness and vibration dampening. The high degree of cooling is achieved by the flow of chilled liquid to dissipate heat. Liquid cooled spindles, which deliver higher performance, are used in high-power applications, high-duty cycles and harsh environments. The following information provides background for various tool holders. On new spindle applications, we strongly encourage you to consult PDS for assistance in establishing your baseline values. The following are recommended parameters for cutter assembly sizes and weights based on the given tool clamping type and operating speed. Values are provided so as not to exceed limits. There are two basic styles of spindles: manual tool change spindles and automatic tool change spindles. The type used depends on the application and size of cutting tools for the application. Electric spindles with manual tool change clamp the tool/cutter using a spring collet in the taper of the spindle shaft. This method offers excellent rigidity at a low cost. The disadvantage is that tool setup is done online, with the machine usually out of cycle for about two or three minutes each change. Electric spindles equipped with automatic tool change (ATC) can be integrated with a CNC for quick tool changes without manual intervention. Typical tool change times are less than 5 seconds. On applications requiring multiple cutters, an ATC spindle offers higher productivity. With an ATC spindle tools/cutters are pre-set in tool holders. Tool holders are typically clamped in the electric spindle by a spring loaded clamping system. Tool holders are released by compressing retention springs and opening the clamping system (typically with a pneumatic actuator). Pre-setting tools occurs off-line using jigs for accuracy and without interrupting production. ISO and HSK are the two most common tool holders used on CNC routers, robots and milling machines. ISO 30 is more popular than the smaller taper sizes ISO 25, 20 and 15. HSK 40, HSK 50 and HSK 63 tool holders provide better cutting accuracy and reliability. Their popularity is growing rapidly due to performance. Electric spindles are used in a broad range of robotic applications. Their compact size, high torque and heavy-duty cycle make them a perfect fit for trimming, drilling, grinding operations and they are offered in manual and automatic tool change styles. PDS is a leader in precision high-speed electric spindles, offering a broad range with our 150 models with power up to 40 hp and spindle speeds up to 40,000 rpm. For your next project, contact PDS and the PDS Application Group for all your spindle needs. A schedule of preventive maintenance will help keep your spindle operating at peak performance. Keep the spindle housing, fans and ductwork clean to allow free movement of cooling air. Clean tool tapers, collet cavities, shafts and collets clean using denatured alcohol. Never use lubricants or oils on tooling items. Failure to keep tooling clean can cause tool misalignment, imbalance, tool slip and poor-quality cuts. Electric spindles need a warm-up period for best performance. Do not apply loads to a cold electric spindle. For warm-up, run the spindle at 9,000 rpm for 10-15 minutes or until the spindle bearing supports reach 98º F (human body temperature). This allows bearings, bearing supports and the spindle shaft to reach their designed dimensions and preloads through thermal expansion. Applying loads to a cold spindle will cause premature bearing failure. Allow cooling system (fan, compressed air or liquid) and bearing pressurization (if used) to run for 10 minutes after stopping work. This minimizes condensation and prevents contaminants from being drawn into the bearing cavities. Keep tools sharp to reduce forces, heat and to maintain cut quality. Monitor increases in electric current to the spindle to detect loss of tool sharpness. Heat generated from tools can overheat bearing grease, evaporate its essential components and lessen bearing life. Maximum bearing temperature of bearing supports is 150º F. Excess heat will cause tool holders to jam in automatic tool change spindles. Be sure all spindle sensors operate properly to avoid damage. CAUTION: All PDS electric spindles with ATC are designed to accept only ISO or HSK style tool holders. BT tool holders are not interchangeable. Use only balanced tools and tool holders and rebalance all tools after each sharpening. Vibration from unbalanced tools can rapidly destroy bearings. Replace any worn, scratched or deformed tool holders and collets with new items to prevent tool slip and imbalance from run-out. Normal collet wear life is < 700 hours. Tool slip leads operators to over-tightened collet nuts and damaged threads. The example below shows details of the spindle model number structure. In some cases, the nameplate will show only a portion of the full part number and configuration. 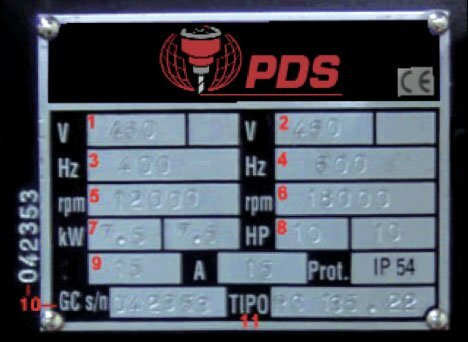 It is important to know configuration details to help identify your spindle and tool interface when you contact PDS.